This drink serves mainly to remind me that I’m picking up quite the bourbon habit in the South. It’s made with Booker’s Bourbon, orange bitters, sugar, and candied orange, though I can’t vouch for there actually being candied orange in the drink—anyone else notice how easily advertised garnishes fall by the wayside and don’t make it into a drink? 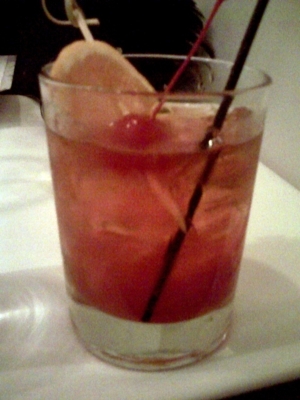 Moving on from that tangent, the So Old Fashioned is a great vehicle for appreciating bourbon’s appeal. I’d double the amount of bitters, but otherwise, I was quite happy with it. The cherries helped.